To be irrecoverable is to be in such a state, that no human being will be successful at setting you free. When demons get their prey to take THEIR side and actually fight FOR them in order to keep THEIR hold, even after the person has found out his or her true condition, and honestly desires deliverance; one of the greatest hindrances being the effect of an assumed position concerning spiritual experiences, which believers are loft to examine and part with. —Jessie Penn-Lewis. 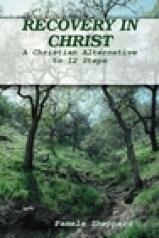 For more information on recovery, deliverance, and similar subjects, click here.